We fabricate and rebuild all types of automotive hoses , including air conditioning, power steering, brake ,oil cooler lines, and more. We are dealers for The Tubes N Hoses System-Brakequip-ATCO. Our specialized processes allow us to rebuild hoses reusing the vehicle specific end fittings as well as new universal fittings. We have the capabilities to reproduce and fabricate metal hard lines for hydraulics, A/C, or any high or low pressure system. We stock a large inventory of hose and fittings to help you service your customers or finish your personal project. Automotive, motorcycle, heavy equipment, aviation, if it has a fluid line, we can help. We welcome mail orders and ship worldwide. 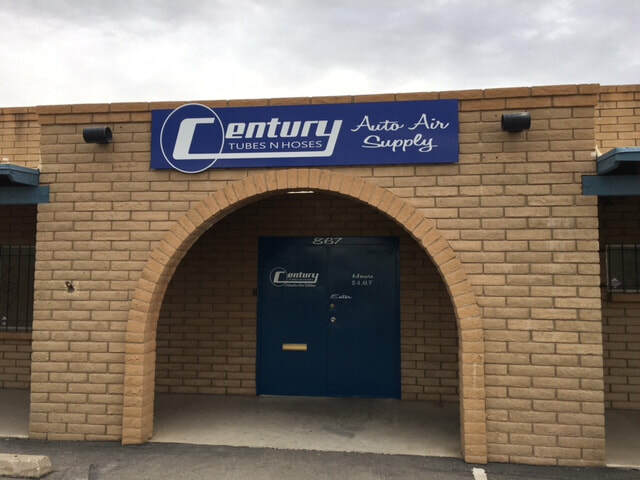 We are a division of ﻿Century Auto Air Conditioning﻿ of Tucson, Arizona. Since 1993 we have been fabricating and rebuilding a/c hoses. We have expanded into other types of hoses by adding Brakequip , Tubes N hoses equipment and inventory. We have found that the processes required to expand were all very similar but used different proprietary equipment to crimp and test the hoses. We only use OE-quality equipment to fabricate and remanufacture hoses. We are authorized dealers of the Tubes-N-Hoses and Brakequip systems. We also use ATCO crimpers for air conditioning hoses - the same as the OE.